Thomas Burke, skilled in the literary as well as the political arts, was taken prisoner by Loyalists shortly after taking office as governor. He was born ca. 1744 in County Galway, Ireland, the son of Ulick Burke and the former Letitia Ould. Little is known of his youth or domestic circumstances, but he apparently was reared by a maternal uncle and accorded the advantages of a university education. Following family quarrels, Burke emigrated to Virginia and took up residence in Norfolk. There he established himself initially as a physician, but later turned to the practice of law. It was while in Virginia that the multi-faceted Burke began to write poetry. He married Mary (“Polly”) Freeman in 1770; their union produced one child, a daughter named Mary. In 1772 Burke removed to Hillsborough where he acquired a small plantation and resumed the practice of law. Rising quickly to prominence, he represented Orange County in all but the first of the Provincial Congresses where he was an outspoken advocate for independence. In 1777 and briefly in 1778, Burke represented Orange County in the House of Commons. On three occasions he won election to the Continental Congress, where the form of government for the new nation was slowly taking shape. As a delegate to the Continental Congress, Burke emerged as a strong advocate of states’ rights and limited central government. He also earned a reputation for his brashness and irascibility, several times becoming the center of controversy. On June 25, 1781, Burke was chosen by the General Assembly to serve as North Carolina’s third governor under the constitution of 1776. The state, however, was ravaged by war and on the brink of anarchy. The recent departures of Greene’s and Cornwallis’s armies had left in their wakes roving bands of Loyalist and Patriot guerrillas, subject to no civil or military authority. Government on both the state and county levels had almost completely broken down. In his inaugural address to the General Assembly, Burke acknowledged that the former rule of law had “changed into a licentious contempt of authority,” yet stubbornly resolved to bring order out of chaos. Governor Burke took extraordinary measures to reform the militia, increase essential revenues, banish intractable Loyalists, and defend against renewed British attack from both Virginia and South Carolina. Acting on his own authority, he established special courts and assumed for himself veto power over legislative acts. Less than three months after assuming office, Burke’s frantic efforts came to an end at Hillsborough when he, along with several other state officials and officers of the Continental Line, was taken prisoner by the Loyalist leader David Fanning. Transported southward to Wilmington and then to Charlestown, Burke was released on parole after an ordeal of two months. 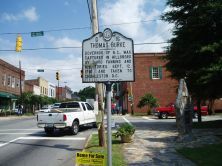 Fearing that his life was in danger, however, Burke escaped from his very loose confinement and returned to North Carolina and the governorship, thereby violating both his parole and the code of honor in the eyes of many contemporaries.